This post is part of the series about these awesome and breathtaking rocks around the world. List giving links to individual rocks can be seen here and a combined big page showing all the rocks can be viewed here..
Mamallapuram (aka Mahabalipuram) a tourist town 60 km south of Chennai, India is famous for its stone carvings which dates back to the Tamil Pallava dynasty in the 7th-9th century. These structures carved out of granite rocks, are among the oldest existing examples of Dravidian (South Indian) architecture. 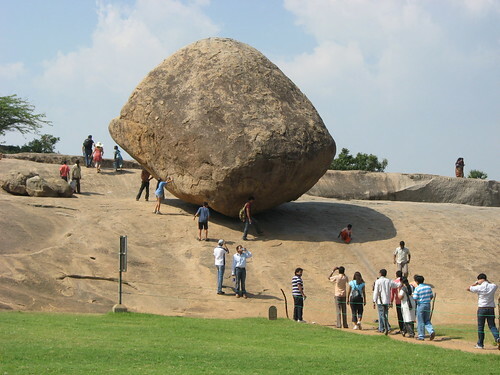 One of the most famous rock here, created by nature and not by any human hand, is a precariously balanced natural rock known as Krishna's Butterball. 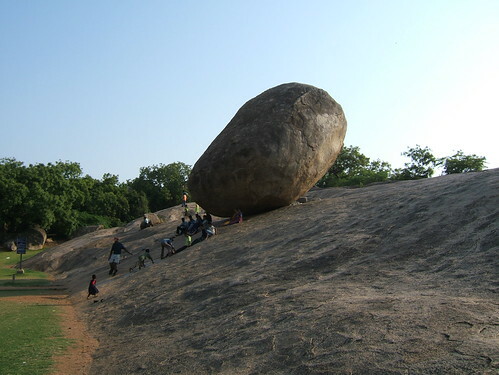 This giant rock is perched on a stony mound seemingly in defiance of the law of gravity. Reportedly the kings in ancient times had tried to dislodge it using elephants but failed. 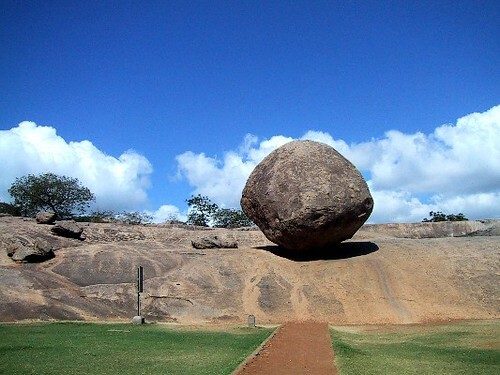 Credits: I am thankful to Soulituder for informing about this precariously balanced rock. Thank you Soulituder!